Vanness Wu (吳建豪) and his new wife Arissa Cheo (石貞善) celebrated their marriage once again with a star-studded banquet held in Singapore on January 4. 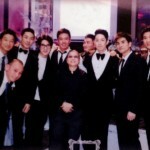 Meeting on the set of his music video in 2006, Vanness and Singaporean heiress Arissa went through an on-and-off relationship fraught with negative rumors. Although they have given up on their relationship at one point, the couple eventually reconciled and became engaged in 2012. They finally registered for marriage on August 9 last year and made an official announcement to fans on August 13. 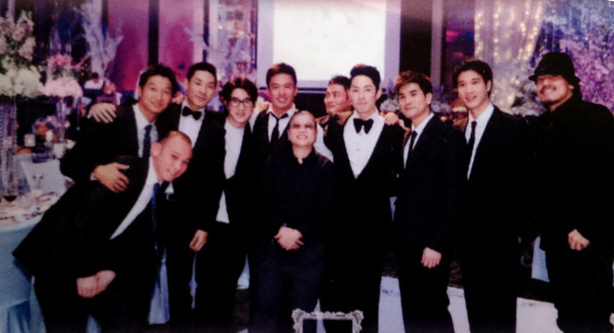 Born and raised in the United States, Vanness held his wedding ceremony on November 16, at the five-star The Resort at Pelican Hill in Los Angeles. The lavish event reportedly cost $1 million HKD, some of which covered airfare and accommodations for their family and friends. Although his former F4 buddies were not invited to the ceremony, good friend Elva Hsiao (蕭亞軒) made an appearance as a celebrity guest and together with Vanness, serenaded attendees with a touching duet. 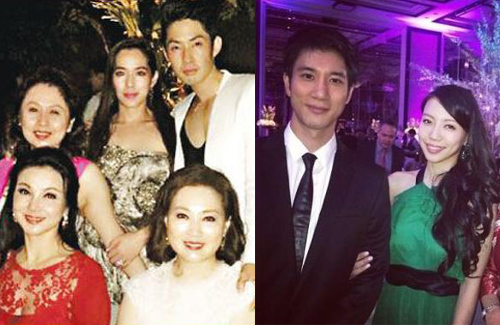 While they chose a low-key approach for their American wedding, Vanness and Arissa hosted a truly star-studded party in Singapore this weekend. Jerry Yan (言承旭) made up for his absence this time around, and close friends Jaycee Chan (房祖名), Andy On (安志杰), and Philip Ng (伍允龍) also showed up to give their blessings. 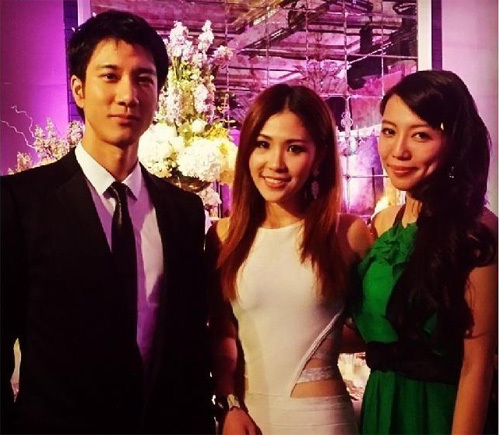 Leehom Wang (王力宏), who was in town for a New Year’s Day performance earlier, took the opportunity to celebrate with Vanness along with wife Lee Jinglei (李靚蕾). Aside from his surprise appearance, Leehom also gifted the newlyweds with a performance of his classic hit The One and Only <唯一>. He continued to send his blessings to the happy couple on Weibo after the event, urging them to make plans for children in the near future. 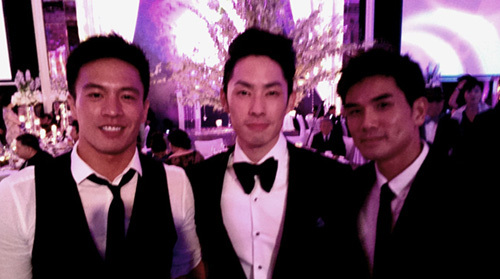 Vanness needs to stop with the surgeries…or rather maybe he needs surgeries to fix his face. 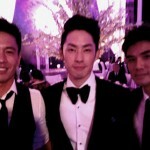 I do not think Vanness had anything major done to husband face, did he? I remember seeing him since the beginning of his career and he looks about the same. Meant to say to his face. Gosh this stupid iPad replaces my typos with the wrong words automatically! It us so annoying! I saw pictures of the wedding. Beautiful! Arissa’s younger brother Elroy was so handsome! Her family is definitely blessed with looks. I look at Lee Hom and wife’s body language and I just feel something is amiss. Too.. not intimate for someone newly married and at a private party. You’re not the only one noticing the deflated romance. Have you seen Leehom’s Thanksgiving family picture on his weibo? Something between the couple is just off course, but then again, they’ve known each other like… forever… so what we might see is just plain contentment. Still wish both couples the best and hope they stick through it in the long haul; both couples are young. I feel the same way. I wonder if that is why many suspect that she is just a cover up wife? I wonder why ppl are hoping Lee Hom is gay rather than wishing him happiness with his new wife. Maybe they are not the type to show their affections thru the camera. Well, no matter how he’d do it, the people will always stick to their idea without even knowing him and his wife personally: If they show openly affection for each other, people will say they are acting. If they don’t show anything openly, everything’s clear – it can’t be real because you don’t see anything. lol. It’s all so ridiculous. I guess the only thing we can do is to ignore these comments. I wonder is Arrisa mixed her family pictures above shown with beautiful anties or her mom. Isn’t one of those ladies up there Hsieh Ling Ling 谢铃铃 (former Taiwanese actress and first wife of movie mogul Peter Lam 林建岳)? Maybe she is mixed somewhere down the line but even she does not realize it. Great to see that Jerry came, but I guessing Vic and Ken could not make it? I still wonder why he did not have one in Taiwan? I wonder if it is because he prioritized his wife’s home country and family and friends?